No, not the musical....C.A.T.S. stands for Card And Tag Swap, an acronym and swap created by my local blogging friend, Joy. C.A.T.S. has been going on for some time now and I thought it would be fun to join in and meet some blogging buddies and make some new friends, too. The theme for July was to use red and blue on your card and tag, and I was paired up with 1LuvnMama who happens to live about a mile away from me. We've never met in person, and possibly passed each other at our neighborhood supermarket or drug store without even knowing it! Mama is on the Greeting Farm's Farm Fresh challenge design team and as you can see, she's super creative so the pressure was on! I colored Cheeky Beach with Copics and used Reverse Wonky Rectangles for the card and tag. Hero Arts' Cling Dots Background was clear embossed and ink distressed with Barn Door and Fired Brick. Both the card and tag were embossed with Sizzix Dots folder. I added Glossy Accents to her beach ball and her eyes, and a bit of Liquid Pearls to the center of the flower. The sentiment on the tag is from The Greeting Farm, and some white seam binding and a blue button finished them off. I'm looking forward to next month's C.A.T.S. with a new partner and a new theme! Hi there! Here's a quick post to share two birthday cards made with Purple Onion Design stamps. On both cards, I paper pieced Faith the Chicken with My Mind's Eye papers and used the Birthday noteblock for the background. Notice Faith's party hat? I used one of the pennants from the Build a Banner set and now she's ready to party on! The second card is a bit more "girly". I've added some flowers from the Doodle Flower set and a sprinkling of pink pearls. Two cards using nearly the same stamps with different looks. And now I've got to get these in the mail! Thanks for stopping by today! Hello! Did you have a crafty weekend? I'm sharing a card that I entered in Penny Black's summer challenge. A sweet friend gave me Penny Black's transparent set called Fun in the Sun and it features several images of Mimi having some summery fun. I colored the image with Copics and ink distressed around the edges then water splotched the background. To ground the image, I drew in some grass with several shades of green Copics. The original sentiment was cut apart to form a one line sentiment. The piece was then embossed with Cuttlebug's Seeing Spots folder. I cut some pennants from some My Mind's Eye papers and used some Glossy Accents on her snorkel mask. I have to admit that I made the pennants as an excuse to use some Twinery twine! I love the different colors and chose Honeydew for my card. My blogging friend, Kryssi Ng, is the Design Team coordinator for Sweet Stamp Shop, a brand new stamp company with fun, sweet images. I'm helping her spread the word about giveaways of their hot-off-the-press stamp sets. So far, five sets have been shared, and here's one of the latest, called Melvin and Vernie. Isn't that the sweetest name for a stamp set? They're a couple of adorable owls with punny sentiments and little add ons, too. All you have to do is visit here, become a follower of Sweet Stamp Shop, "like" them on Facebook, and leave comments at each blog post for a chance to win that stamp set. Easy peasy! The winners will be announced in early August during their grand opening and blog hop. You can keep updated with Twitter, too! So go and check out the stamp sets....now! Good luck! I can't believe it's the last week of Summer Card Camp. It's been so much fun--the sketches, the color challenges, and the great tutorials, too. Here's my card made with this week's color combo using all Purple Onion Designs stamps. I paper pieced Faith the Chicken with some My Mind's Eye papers and the flowers were also paper pieced and colored with Copics. The sentiment was cut apart to form a one line sentiment. I also used the zigzag stitch stamp from the Stitches set which is on sale for half off in the Purple Onions store. Hope you're having a crafty week! Thanks so much for stopping by! Hello there! Did you have a good weekend? A lot of friends are heading off to CHA and I'm hoping to see more sneaky peeks of lots of new goodies and "must haves" while they're there, and after they return! Here's a card that I made for the current theme at Hero Arts, which is Summertime & Parties. I used the Let's Chill stamp set (that I was searching for and finally found) together with Reverse Wonky Rectangles. The little bird, coconut tree, and tropical drink were colored with Prismacolor pencils and Copics. Isn't he too cute? I used Glossy Accents on the bird's sunglasses and the coconuts, too. I tied a bit of twine on the bottom, added faux stitching around the edges, and the sentiment is an oldie from Hero Arts. Hope you're off to a great week! Thanks, always, for stopping by! 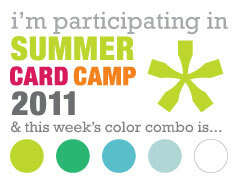 This week's colors at Summer Card Camp are my fave! If I could, all my cards would be kraft and browns and a touch of red! Love it! I thought of paper piecing again and my Purple Onion Designs stamps were in front of me so I grabbed some Jenny Bowlin papers and quickly put this card together. What took the longest was trimming out the little fence. I popped up the heart and one of the clouds for a bit of dimension. The edges are stamped with Purple Onion's Stitches set which is now on sale for half off in the shop. You get a set of unmounted stamps in three different stitch patterns--what a great buy! 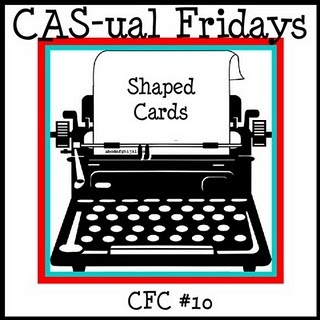 I believe I made the deadline for CASual Fridays' tenth challenge which is shaped cards. I love using my Nesties but thought I'd make an actual shape to go with some Paper Smooches stamps that needed some inking. I adore this birthday set. Very punny sentiments and the images are so darn cute! Apple. Worm. Need I say more? Party worm! And I love the large sentiment set, too. I don't know if this is considered CAS because it has so many pieces, and I ink distressed the edges of the apple and leaf to give it some depth. Is that a no no? Is it supposed to be cleaner and simpler? Thanks for stopping by today...Hope you're having a great week so far! Hello, friends! I wanted to share the biggest card I've ever made. That's because this Suzi Blu stamp, Spring Flower Chic, is huge! 6.75" from head to toe and 4" across. Huge! I was going to put her on the cover of a journal, but when I saw my friend Emily's blog and her card using the same image, I wanted to try paper piecing and make a card, too. I stamped her and colored her hair, skin, and flowers with Copics, and paper pieced her clothes with My Mind's Eye papers. I colored in some grass and stamped the sentiment by Hero Arts. I'm still hoping to stamp her on the cover of a journal, or even on canvas. But for now, I'll have to get some large envelopes! Have a good week and thanks for stopping by! Hello there! I've had several inquiries as to how I stamp Purple Onion Designs unmounted stamps. I've been a long time POD customer, way before I was invited to be on their design team. Purple Onion Designs stamps are made of deeply etched red rubber. Unmounted stamps are such a great bargain, and you can't beat storing a large amount of unmounted rubber vs. woodblock stamps. When I first bought noteblocks, I loved them so much that I ordered some custom size wood blocks to fit. Then when acrylic blocks became popular with cling stamps, I bought some cling foam and mounted the noteblocks on them. Michele gives great directions here on the POD site on how to mount unmounted stamps. She also sells red mounting cushion if you happen to have your own wood. I use a repositionable tape runner and run it on the back of the rubber, then stick it on an acrylic block. Because POD stamps are so deeply etched, you're able to get clean, crisp stamped images just by using a temporary adhesive. All the images on these cards were stamped without any cushion or cling foam, and they stamped cleanly every single time. Hope this post helps you understand how I stamp with unmounted rubber--and you can, too! Hello there! I just can't believe it's Friday! Didn't it creep up quickly this week? I have another card to share with Kiyomi from Sister Stamps. I stamped and colored her with Copics and popped up the butterfly for a bit of dimension. I added some washi tape on the bottom to "ground" the image along with a few pearls and a sentiment by Hero Arts. And I found my set of stamps that I was looking for! Happy day! 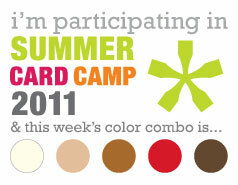 I'll be working on my card with a summer theme this weekend. Do you have any plans for the weekend? I misplaced a set of stamps. I remember putting it somewhere, thinking I was going to see it when I opened up wherever it was that I put them, but I really can't find them. I've looked everywhere. Even my daughter helped me. Still, no stamps. 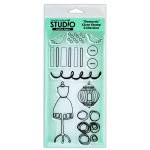 I did find this set of Creative Layers stamps by Claudine Hellmuth that I bought a while ago from Inspiration Emporium. There are two sets--a foam set and an outline one. 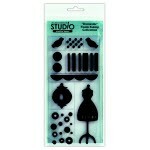 You can just use the outline set and color in the images, or use them together with the foam set. Stamping the outline over the foam image isn't perfect. It's a little offset stamping for a retro look. Claudine suggests using acrylic paints on the foam stamps, but I used distress inks and created this card. Once I started, I couldn't stop. I stamped, overstamped, distressed, and Stickled the card and it was FUN! When was the last time you made a card just for fun? And no, I didn't find the stamps yet, but it was a productive afternoon nonetheless. A few months ago, Heather Maria hosted a Hero Arts ATC (Artist Trading Card) swap and I thought it would be fun to join in. I was paired up with Janet (swanlady21) and we decided to both use Starburst Lace and any bird image. Here's the ATC that I sent Janet. I stamped Starburst Lace in the corner and used Peeled Paint and Broken China to ink distress the background. I used the dove from Swirl Christmas because I wanted a bird in flight. I added a few drops of Liquid Pearls and the sentiment is by Hero Arts, too. It took FOREVER for my ATC to reach Janet! Did I mention that she lives in Mauritius? We were probably the "furthest apart ATC partners living on an island" in the swap! When I mailed the ATC, the postal clerk did a double take at the address and asked, "Where?" I said, "Mauritius. It's near Madagascar." And he said, "Ohhhhh......" and I'm sure he still didn't know! Aren't they gorgeous? I love how one depicts a sun, and the other, a moon. She also included some beautiful papers and die cuts. Thank you, Janet, and thanks for being so patient, too! Hope you're having a safe and Happy Fourth of July holiday! I preordered my stamps from Pineapple Cove, a local stamp and scrapbook store, and they just arrived! I couldn't wait to ink them up and create a card. Here's my tent card made with Kiyomi. I stamped her in brown ink and colored her with Copics. The reds were a bit too dark and covered up the designs on Kiyomi's kimono, so I used my white pigment ink pen and dotted a pattern instead. I love the dimension from a tent card, and how it folds flat for mailing. 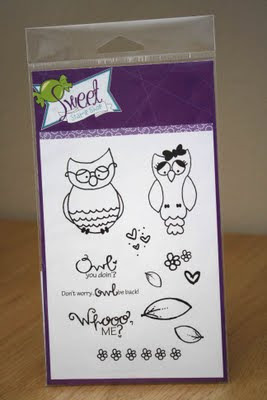 See Beate's tent card tutorial here and visit Sister Stamps to see how you can get your hands on these adorable stamps. 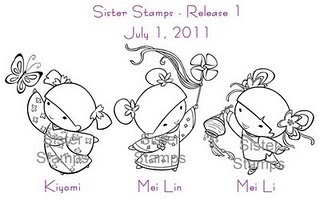 To see more card samples and projects, visit the Sister Stamps Flickr site here. Lots of cute inspiration! Thanks, always, for stopping by and have a wonderful weekend!